Bread & Butter Berlin trade show is over. 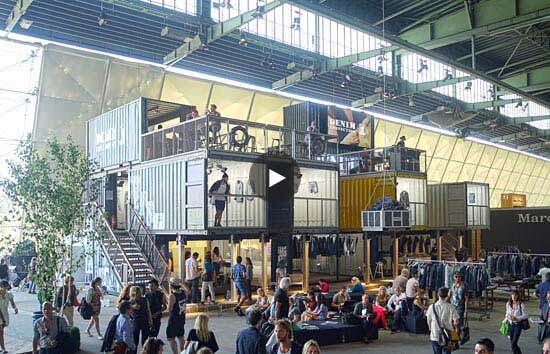 It’s been a wild year for Bread & Butter, the once leading-edge fashion and denim trade show in Berlin. On June 8, 2015, Zalando the Berlin-based online platform for fashion bought Bread & Butter and the intention seemed that it would continue the tradition of the show. With the help of Zalando, insolvency proceedings would be closed by 1st October 2015. The summer show did take place on July 7-9 in the Airport Tempelhof, but only two halls had exhibitors and the reviews were poor. The energy and character of the show, including the depth of brands just was no longer there. Urban base area from Bread & Butter Berlin last summer. Ironically, other shows across Berlin Fashion week were doing quite well, including Bright, the streetwear and action sports show which was located next to Seek, and later during the show, announced they were bought by Premium. Other shows such as Selvedge Run moved into the space once dominated by Bread & Butter. The team at Label Networks has visited Bread & Butter several times, and we were always incredibly impressed with this show. Not only did Karl-Heinz Muller and his team seem to be leap-years ahead of the trade show world in terms character and design, they provided networking and inspirational opportunities that soon became the highest standards for fashion trade shows. Everyone wanted to be like Bread & Butter. Yesterday, July 14, 2015, Bread & Butter sent out the following email below. They are now officially over. We will miss this show. And in the end, your understanding. THANK YOU for 14 wild and wildly intense years. BREAD & BUTTER is dead, long live BREAD & BUTTER!